Here are the steps in brief, be sure to read on below to learn more! Since it was founded in 2012, graphic design and collaboration tool, Canva, has grown to become a big deal in the marketing world. After a recent funding round it is now valued at $1 million and is available in 190 countries to an active user-base of over 10 million. With its simple sign-up process, and intuitive user experience, Canva could be the tool all non-creative marketers need at their fingertips. I’ll guide you through how to log in and sign up, and highlight the ways Canva can benefit your marketing activity. Go to www.canva.com, and navigate to the top right hand side of the screen. Click the button Log in with Facebook. If you’re already logged in to Facebook then you’ll be directed straight to your dashboard where you can start creating a design. If you registered your account with your Google account then you can login in the same way as you logged in using your Facebook account. On the homepage, navigate to the top right hand corner. Next to the Log in button choose the drop down menu item, Log in with Google. You’ll now be directed to your Canva dashboard where you can start creating designs. If you’re signed in to your Google account then you’re directed straight to your dashboard where you can start creating designs. If you’ve forgotten your email address then you won’t be able to use it to reset your password. Canva’s support pages suggest that, in this scenario, you get in touch with their Customer Happiness Team via the Report an Issue- Account form on this page. You then need to provide as many details as possible so that Canva can help you remember which email address you used to register your account. A corporate firewall is blocking Facebook. To resolve these issues you’ll need to either make sure Canva is exempt from the ad-blocker you’re using; or open a tab that’s not in incognito mode. If Facebook has been blocked by a corporate firewall then you’ll need to discuss this with your systems administrator. The signup process finishes when you confirm your email address by clicking the link sent to your inbox. Canva isn’t built purely for corporates. They understand that nonprofits rely on great visuals to engage the general public and grow their following too. They need to portray often difficult messages in a highly impactful way as part of their outreach and fundraising. And nonprofits are often, by definition, on a budget. Canva also identifies educators as those who need special access to design tools. Canva is pitched at 3 different price points. The standard free version gives you two folders to organize your designs, 1GB of storage, 8,000 templates to choose from, the ability to upload your own images and access to Canva’s photo bank at $1 per photo. Canva for Work, at $12.95 per month, offers you all this plus extra folders and storage, the ability to collaborate with colleagues, access to up to 400,000 free photos, extra editing functionality and more. Canva Enterprise (prices are discussed on a case-by-case basis) are for the larger corporates, providing everything included in Canva for Work as well as administrative controls, team price plan and a dedicated account manager. Marketing is a visual medium and so all content needs to appeal to the eye, first and foremost. According to Adobe’s The State of Content, 38% of consumers will stop engaging in a website if it doesn’t look good. In the same report, it was found that if given 15 minutes to consume content, ⅔ would rather read something beautifully designed than something plain. Alarmingly, consumers also equate credibility with visual appeal, according to John Waters’ book, The Real Business of Web Design. According to his research, 46% of consumers base their decisions on the trustworthiness of a website with their aesthetics. If design is this important to the making or breaking of a business, then companies at all levels need access to design suites that aren’t too complicated and don’t break the bank. Canva manages to check both boxes, and is available for free for smaller organisations or individuals who aren’t in a position to be hiring designers or spending vast amounts on design suites like PhotoShop. The role of a modern marketer is complex, requiring a set of skills more varied than in almost any other job. One minute they can be writing a lengthy blog post, the next they’re shooting video. To expect marketers to be skilled in all aspects of design and creation is simply unrealistic. And not all companies even have dedicated marketers to start with. This is where tools like Canva come in. 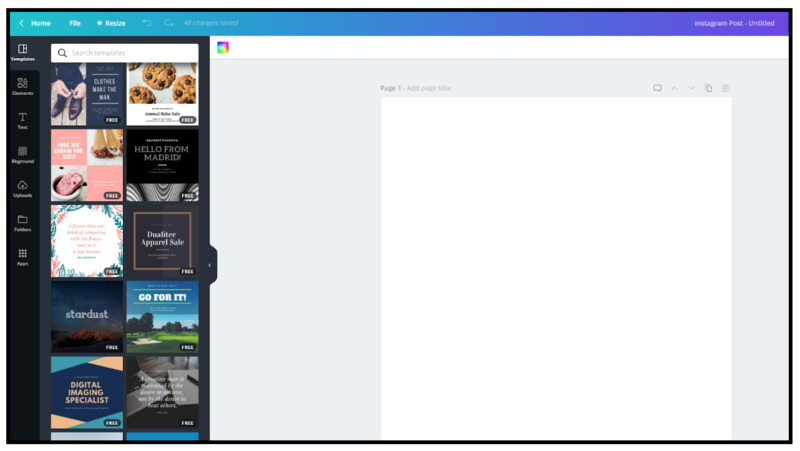 Not only is Canva extremely intuitive, but it also comes with a vast tutorial section. Those who want to learn the ins-and-outs of aspect ratio and font combinations can educate themselves in the Canva Learn pages and video tutorials. This section also helps those who aren’t trained in marketing or branding with tips on keeping a consistent brand across all of your company’s visuals. For marketers, particularly those who aren’t skilled designers, Canva has pretty much everything needed to produce great, consistent content. You simply need to choose which content type you want to work on, and you’re presented with a blank canvas, already in the appropriate dimensions. One of the things I like most about Canva is that you don’t have to download any software and you can access it on desktop, tablet and mobile with the same login. The design editor is also extremely intuitive, with many elements resembling other editing suites PhotoShop, Pixlr and even MailChimp. Don’t forget to name your draft in the top right hand corner. You can edit and rename this at any time. From this point, it’s up to you as to how you build your design. Your tools are all on the left hand panel and consist of graphics, charts, photos (you can upload your own too), text and many more items. Saving and sharing your finished design is also simple. When you’re done, go to the top right hand side of the editor and you’ll find a Download button. In this dropdown, you’ll be given a long list of options as to where to publish your design, from a list of social accounts, to Slack, to an embed code or publishing straight to your website. They recommend downloading it to your device first, however. Or you can choose to share it with a colleague by clicking the Share button at the top and entering another email address. If Canva has set out to be an accessible tool then it definitely succeeds. And it’s not one of those frustrating pieces of kit where you’re severely disadvantaged by using the free version. Canva genuinely works for all budgets and its price-point reflects the functionality you get for your money. It also lets those on a free account pay for elements of design on a pay-as-you-go basis without being locked into a monthly fee. And what I always like with online tools is a decent-length free trial – in this case, 30 days. It takes time to work your way around a tool and to decide whether it’s worth the investment, so 30 days is about right. Whilst the collaboration function isn’t available on the free tariff, the paid version is worth considering if you’re a team that works closely and collaboratively on designs and branding. You can share your designs with team members, but you can also share whole folders. Ever run into the problem of working on the same design as a colleague in PhotoShop, only to discover that your work has been overridden? Not a problem with Canva. While designs are being worked on, users can choose to keep the project public, or – a must when you’re mid-edit – keep it private amongst your team. A consistent brand is one of the cornerstones of a good business. An inconsistent brand, according to Lucidpress, creates market confusion, while a consistent brand increases a company’s revenue by around 23%. Canva’s “Brand Kit” (accessible on the Canva for Work plan) helps companies with this. The brand kit lets companies keep all the elements of their brand – font, colours, designs, logos – in one place, so that they can be accessed every time you create a new piece of content. Canva is a tool that all marketers should have access to. It’s user-friendly, helpful and you get exactly what you pay for. I originally signed up to the free plan and used it for a while before realising that, for the extra functionality, $13 a month was well worth it. That’s not to say that the free version is under-par. In fact, for individuals out there, it offers a huge amount, and extras can be paid for on an ad-hoc basis. What I most like about Canva is that it supports collaboration in a way in which most tools don’t do. Colleagues can work in real time on the same projects simultaneously and share files and folders. And, although I’ve never had to call on their customer support – there’s always a “help” chat bot hovering if the need arose – the wealth of resources on which to to call is astounding. Overall, Canva is worth a try. Sign up to the free version for a while, and see how it supports your marketing. If you’re left needing more, then try the trial for 30 days. I bet you won’t be disappointed. Do You Want to Grow Your Business With More Sales and Leads? Let us audit your site or content to see what kind of response you could be getting. Having Problems Driving Traffic To Your Blog No Matter Which Marketing Tactic You Use? Get Our Complete Guide to Building Your Blog Audience and Learn How to Drive Hundreds of Thousands of Visitors to Your Site Fast.